Image caption The private school's headmaster says the advert should never have "seen the light of day"
A private school has apologised after its advert suggested those who went there would eventually be rich enough to "buy their dad a Jag". The advert for Vinehall School in East Sussex told the story of a boy arriving in his father's Volvo, but wishing he had the headmaster's Jaguar. After attending the school and being "very successful in business" he buys his father a Jaguar when he retires. 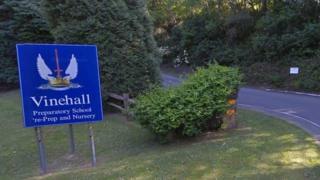 Vinehall's headmaster said the advert was a "misguided error of judgement". The independent day and boarding school in Robertsbridge for children aged between two and 13 charges fees of up to £23,000 per year. The advert has been described on social media as "hideous" and "cringeworthy". NickScribbler tweeted: "Cringe. Not only awfully conceived but hideously written. Surely no copywriter involved here. Just someone who went to public school and now teaches at one." Head teacher Joff Powis said: "I very deeply regret the widespread offence caused by the recent open day advertisement. "It was wholly misguided, and should never have seen the light of day. I must stress it is in no way a reflection of the ethos of our school. "We are taking a long hard look at how it came to be created in the first place, but as Head, I must take full responsibility for its appearance, and can only apologise for such an unfortunate error of judgement. "Vinehall prides itself on being a friendly, inclusive place, where the values of modesty and broad-mindedness are at the forefront of our guidance and teaching." The advert has been withdrawn.